Wiki: does kyle have a moustache? I feel like I was just beginning to peel the layers from Incantation’s Vanquish in Vengeance. Their sound is definitely solidified, you know when you are hearing Incantation, their sounds is variably identified within death and doom. They take the whole “I am evil, spooky” theme a little far, but for the most part it’s some good fiction to read. Their newest release Dirges Of Elysium, caught me off guard, as I said before I was still giving Vanquish in Vengeance a healthy amount of listens. This new album has some real hook, line and sinker moments, but it does become a tad bit on the boring side, after a while. A complaint I guess I have with all of their albums. 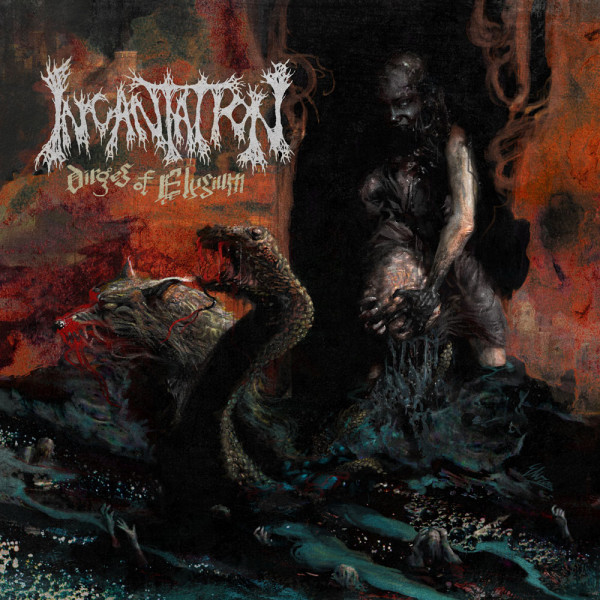 What makes Incantation enjoyable, is that they encompass the ability to capture atmosphere. The artwork is great, the whole package is very well done. This has all the signs of a great release, but it does fall on the boring side. There is absolutely no way in hell I could review each album, but it does fall on the same kind of sound. Nothing wrong there, because it works. But its just not as distinctive as with other bands like Deeds of Flesh.